Where Do You Find God in Art and Beauty? 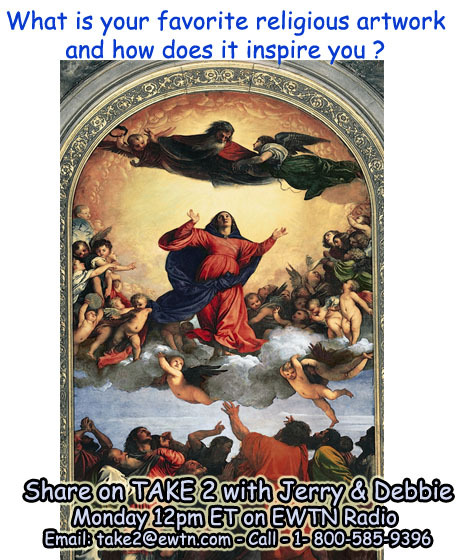 On Monday, Jerry and Debbie will welcome your takes on how you have come to discover God more profoundly through religious art, the beauty of nature, beautiful music, etc. Remember, as a peer-driven program, what you share on the air can make a difference in the lives of countless people. Looking forward to being back with you again on Monday! Hi Jerry & Debbie, I really enjoy your show and try to losten each and everyday. Just one question that has been with me to ask in quite sometime. I have read a couple of books about NDE (near death experiences) . Is it correct to believe in these stories and how does it effect my Catholic faith? My take on these stories is that God brought them back to earth to tell their story ablut what had happened to them. To get the word out since we are the voice of God. What do you both think of these kind of stories? God bless you both and please keep up the great work that you do. My name is Gary from Montana, I drive truck and deliver product for electricians. All areas are local, good job I get this chance to hear you.